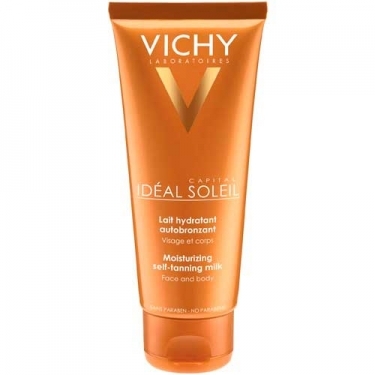 DESCRIPTION: Idéal Soleil Lait Hydratant Autobronzant from Vichy is a self tanner for face and body. It offers tan in just 1 hour and hydration by 8am. Formulated with DHC and Vitamin E, the result is a gradual and natural golden tan that leaves no trace. The texture is melting, non-greasy and with a velvety finish. Tested under dermatological control on sensitive skin. Hypoallergenic and non-comedogenic. Apply evenly, taking into account the hairline, eyebrows, ankles, knees and elbows. Avoid applying near the eyes. Apply 2 to 4 times a week, depending on the desired result. Wash hands after use.